Nigel G. Mitchell - Author, Blogger, Geek: New Release: "Call Center of Doom"
New Release: "Call Center of Doom"
Rygel Poxio is an alien who works in the deadliest call center in the universe. His job is to call Earthlings to ask if they would surrender to the Xenon Empire in exchange for a free car or iPod. When he has a crisis of conscience, Rygel must find a way to save the world. In October, I lost Internet access so I had some free time. I decided to turn some of my 100-word fiction into full-length stories. One story I picked was "Cold Call." "Cold Call" was just supposed to be a one-off gag about a telemarketer calling Earthlings with a twist of the telemarketer being an alien. Just as a lark, I put in a reference to the Xenon Empire from my alien invasion comedy novel, Flying Saucers. That made the story more interesting to me. I decided to expand "Cold Call," mainly because it gave me a chance to dive back into and expand the world of Flying Saucers. It also tapped into an opportunity to mine my real life experiences. I've been working in call centers for almost a decade, and "Cold Call" let me talk about the quirks and frustrations of call center life through the filter of comedy and science fiction. The story ended up being retitled Call Center of Doom. The thing I like most about Call Center of Doom is that it’s all about what life is like on the planet Xenon. We didn't get to see much of Xenon in Flying Saucers. I was able to flesh out the culture and technology of the Xenon Empire, and show things from their point of view. Also, much like Flying Saucers is about seeing a character outside of the powerful military complex we normally see in alien invasion stories, Call Center of Doom is about a lowly peon in the Empire. The idea of something as mundane as a call center working to conquer Earth seemed funny to me. In Call Center of Doom, Xenon functions with a system of earning citizenship. If you're not part of the military dedicated to world conquest, you can earn citizenship through related service (inspired by the same system in Starship Troopers). 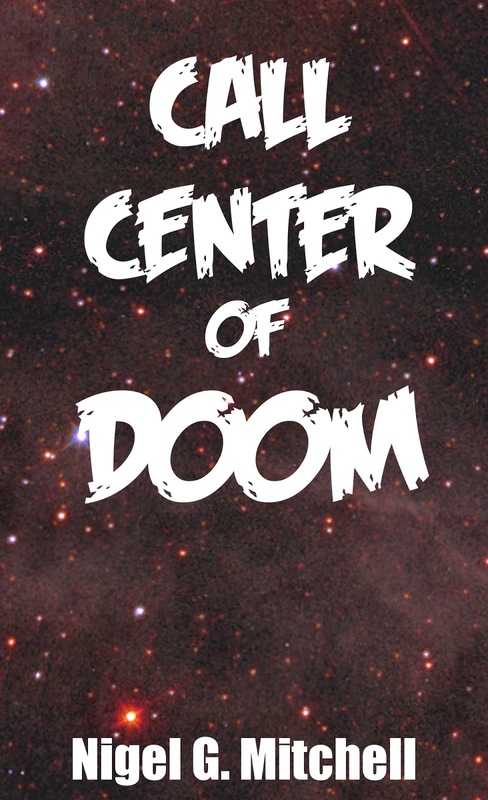 If you enjoyed Flying Saucers, I think you'll enjoy Call Center of Doom. If you haven't read Flying Saucers, the story stands alone, so you can enjoy it by itself. You can download CCD at: http://amzn.com/B00HBY9IDS for only 99-cents If you've read both stories and would like to see more of the Flying Saucers universe, let me know at my contact page. If you subscribed to my newsletter, you knew about this release months ago. To hear about my new releases first and get a free short story, sign up for my newsletter.